Sweet Romance Reads: Sweet Romance Bargain Book for Lovers of Westerns! Sweet Romance Bargain Book for Lovers of Westerns! 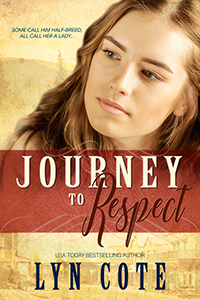 Through the month of August, my book Journey to Respect, is on sale for 99 cents, marked down from $2.99. This is the time to buy! Rafe McKuen, the son of an Osage chief’s daughter and a successful American fur trader turned planter, has one foot in each world. Since childhood, he’s visited his mother’s tribal camp near St. Louis. And at his father’s New Orleans Plantation, he’s the “invisible” but beloved son. Where will he make his home--in which world? Sounds like a great read, Lyn. Thanks for posting. It sounds like another wonderful read, Lyn!